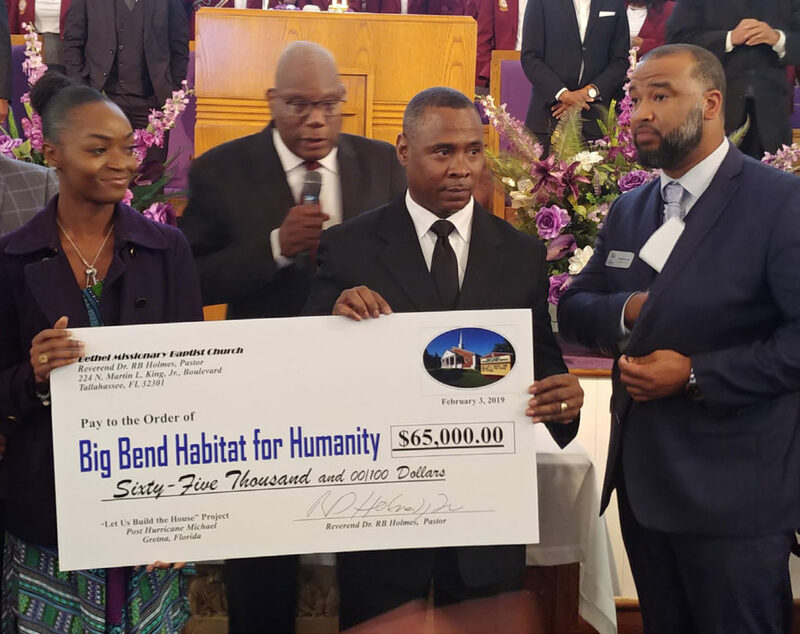 Members of Bethel Missionary Baptist Church presented a check in the amount of $65,000 to Big Bend Habitat for Humanity to construct a new home in Gretna for the Akins family. 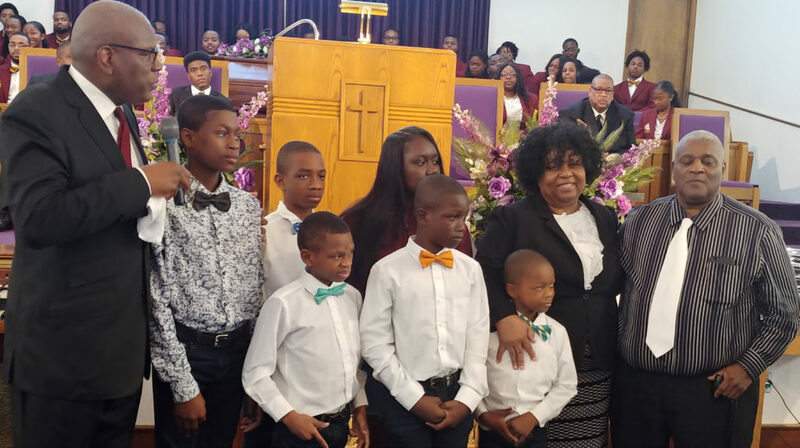 Delores Akins, her husband and six grandchildren stood in front the congregation at Bethel Missionary Baptist Church on Sunday for a ceremony that marked the final step to construction of their new home in Gretna. It was what Akins’ family had been waiting for a year before Hurricane Michael ravaged through their small town just west of Tallahassee. Bethel’s pastor, Rev. R.B. Holmes and church officers presented a $65,000 check to Big Bend Habitat for Humanity to finance the home. “Joy,” said Akins, expressing her appreciation for the effort led by the church. “I just got great joy, knowing God’s favor was on me through his people. Construction is scheduled to begin in March and the Akins’ are expecting to move into a five-bedroom, two-bath home in April. All eight family members are current in a three-bedroom house with one bathroom. The house didn’t sustain much more than some roof damage from the hurricane. However, the family didn’t have electricity for 10 days after the storm and was forced to stay with one of their children in Tallahassee before moving back to Gretna to find the town of 1,400 people destroyed. The family applied for Habitat assistance in September 2017, Delores Akins said. Meanwhile, they applied for financing and waited to get the call. Rev. R.B. 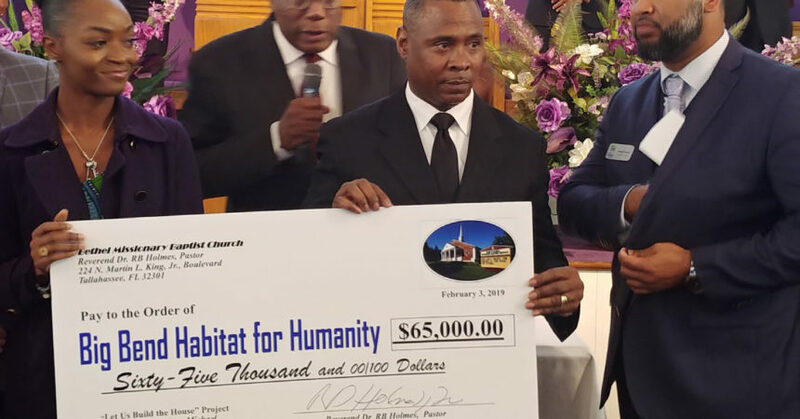 Holmes (left) presented the Akins family Sunday at Bethel Missionary Baptist Church. Hurricane Michael fast-forwarded the process, said Antoine Wright, executive director of Habitat for Humanity. The ball got rolling soon after Holmes and members of the Bethel congregation went to feed residents of Gretna following the storm. Choosing the Akins family wasn’t difficult because they were already in the pipeline and had gone through the vetting process, Wright said. In December, Holmes asked his members to contribute to a fund-raising campaign for the $65,000. Holmes said the church has adopted Gretna and will continue to help until the town is restored. Gretna Mayor Anthony Baker said the community is far from complete restoration. Getting to that point will take more partnership like the one that Bethel formed with his town, Baker said.